Liverpool in 2008: commemorating an amazing adventure. A bright hard sunlight lit the Liver building in Liverpool on Saturday. It was weirdly hot, people had pulled out their summer clothes to give them one last airing, and the Albert Docks were thronging with people. Silas listens to the oars plopping into the water again and again - each stroke is taking them away from everything he knows. Soon they will have gone too far to come back: he remembers his mother clutching at him, making him promise that he will write, his sister kissing him hard on the cheek. Already it seems a different world, and yet they are just across the river, one stretch of land and then another, not very far. ‘Look, Dadda!’ All at once the ship is looming large and close beside them. wood scrapes against wood, and the ship is like a wall, the only escape up a ladder, one after the other, passing children, bags over onto the deck, until they are all aboard and the deck sways beneath their feet and the boat moves away back to shore. They look at each other and smile. The air is clearer here, cooler and fresher. I think that particular passage has been edited out of my novel now. Ah, I have written so many words, and have got rid of so many too, and now I am beginning to edit again. The final one, I hope. 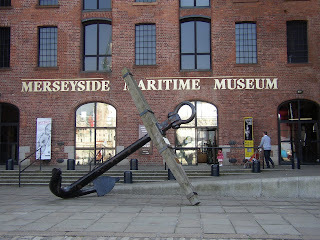 I had come to Liverpool to visit the Merseyside Maritime Museum. 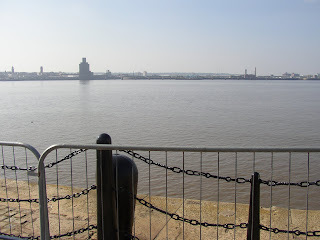 More people migrated from Liverpool than from any other port in the world. From here they went to Australia, New Zealand, Canada and of course the United States. 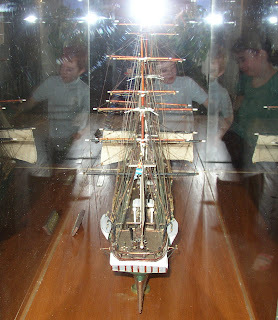 There is a marvellous permanent exhibition on this, including a place that (I think) rocks like the deck of the ship. When I was researching my novel I came here a few times. I imagined myself being in the hold of the Mimosa, recently converted for its passengers from its usual cargo of tea. 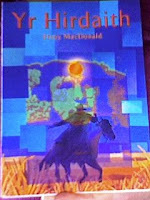 the archivist, Bruno Derrick, and another writer, Elvey McDonald. Elvey has written this book on the emigration, 'Yr Hirdaith' which I had hoped my father would translate for me, because it is in Welsh (but sadly he has never felt well enough to get round to it). I am assured it is excellent, which makes it even more aggravating that I have never been able to read it. 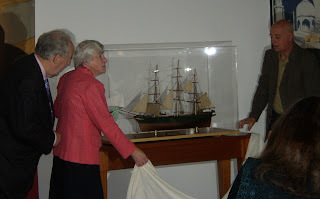 Then, at last, came the moment we had been waiting for: the unveiling of this accurate model of the Mimosa by Mrs Elan Jones (pictured here together with the chairman of the Merseyside Welsh Heritage Society, Dr D Ben Rees, and Tony Fancy). Elvey McDonald, like Elan Jones, was born in Patagonia and now lives on the West coast of Wales. I like this picture of two of his grandchildren looking at the model. And, talking of books, here is Susan Wilkinson, who is related to the Irish doctor who accompanied the colonists to Patagonia. 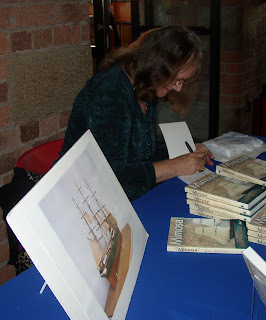 There is an interview with Susan and a short review of the book here. The day finished well: Susan and I went to a cafe and had a very long chat about Patagonia, research and writing, which I enjoyed very much indeed. 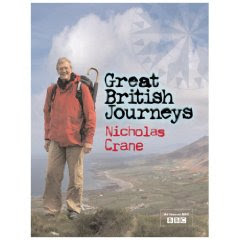 Sunday Salon 11.35 Great British Journeys by Nicholas Crane. 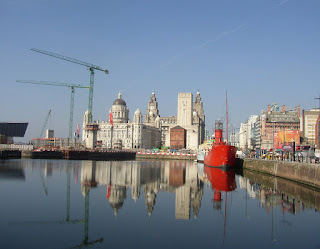 Yesterday I added 'Liverpool' to the small British Journeys I have been making recently, but more about that later. 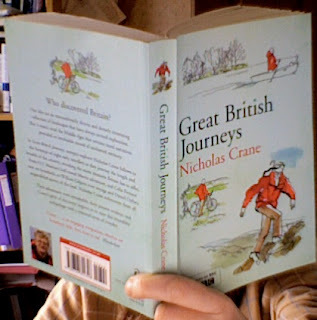 This morning, for Sunday Salon, I am reading about more impressive undertakings, Great British Journeys in fact, a book written by the television presenter Nicholas Crane - and they are fascinating. Rather unexpectedly, the journeys I have read about so far have literary connections. 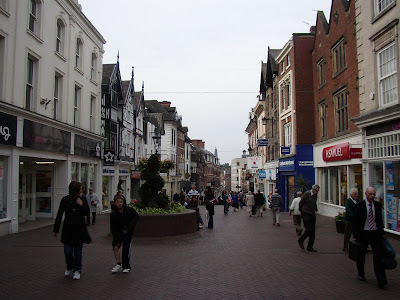 The first traveller was Giraldus Cambrensis (Gerald of Wales) in 1188. Now I've often heard about this writer in my many travels around Pembrokeshire, and have even been to his birth place - Manorbier Castle. I'd thought he was just some sort of wandering monk, but it turns out that he made the first recorded circumnavigation of Wales, and he did this because he was trying to drum up support for the Crusades. He makes a record of how things go and this provides the basis of an early example of travel-writing. Nicholas Crane later follows in his footsteps, and skilfully manages to evoke the terrors of travelling in a land of wild unpredictable terrain and even wilder and more unpredictable natives. There is quicksand, wide swirling rivers, sheer slopes, narrow passes, and, worst of all a hostile people. Few seemed to be swayed by the call to the cross, but Gerald seemed to determined to gloss over this. 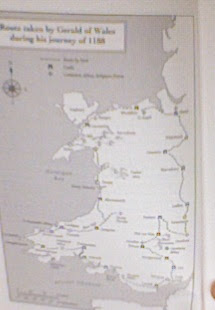 He completed his journey in a little over six weeks, and returned to Hereford exhausted - but at least now he had a map of Wales in his head. In later life he would direct the drawing of a map of this little principality, recording the position of monasteries, castles and churches. Even more interesting is the next chapter on John Leland. John Leland landed in Henry VIII's court mainly because his fashionable education in Paris and his connections in court. He was a writer, and his poetry was read out during the coronation of Anne Boleyn. 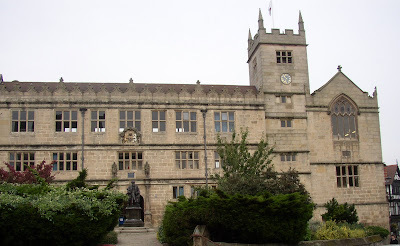 He was also a librarian, and it was in this capacity that he received a royal commission 'to make a search after England's Antiquities, and peruse the Libraries of all Cathedrals, Abbeys, Priories, Colleges, etc as also all places wherein Records Writing and secrets of Antiquity were reposed.' (a quote in the book from Anthony Wood, a great seventeenth century Leland scholar). Leland was equipped with a 'special pass' (which seems to me to be something like a dream ticket) to allow him access to all these collections, and rode all over the country picking out choice volumes for the King's own collection. The monasteries were already under attack. In 1536 there had been an act which suppressed all monasteries with and income of les than £200 per anum, and John Leland doubtless saved many valuable books. His journeys were haphazard, and suffered because he had little idea of navigation. Triangulation had only just been described in Europe, and the practice of mathematical surveying had yet to become established in England. 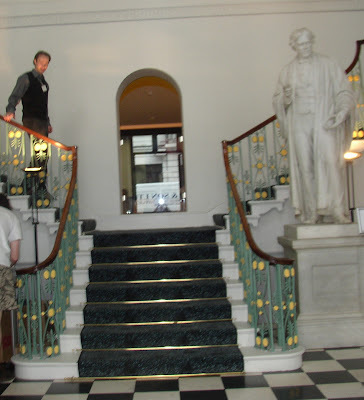 Nicholas Crane describes John Leland as a poet, librarian an auditor and not a mathematician. Insomuch as they are arranged at all, the notes are left around the routes he travelled. A modern traveller could spend a lifetime trying to trace John Leland's footprints to and fro across across England and Wales . But it would be a journey into madness, for Leland's quest had no end. His itinerary crosses and recrosses itself. He returns to places he has already visited, and describes them over again slightly differently. With each visit the Itinerary accumulates more layers but less form. Wonderful stuff. Nicholas Crane, of course, nevertheless takes up the challenge, and follows in Leland's footsteps to Cornwall. It makes exciting reading. 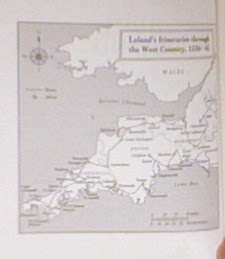 Cornish people are related to the Welsh, until the last century it was possible to find people that spoke Cornish, which was a variation of Welsh, and also related to Breton, and I am happy to report that John Leland found the sixteenth century Cornish as hostile as Gerald found the twelfth century Welsh. The landscape is similarly difficult too; but whereas Gerald was in the middle of a balmy period in the climatic history of the British Isles, John Leland explored during the two hundred year mini ice-age. In both cases the coast was under attack: i n the twelfth century due to expansion of the water with temperature, and in the sixteenth due to storms and extreme weather. Droughts one year would be followed by excessive rainfall in the next. An extremely cold winter could be followed by a blazing summer. As a quote from Professor Brian Fagan says in the book 'The pendulum of climate change rarely paused for a generation.' This is sounding very familiar. York, Shrewsbury, and now London - and what has come to be my monthly fix in the capital. 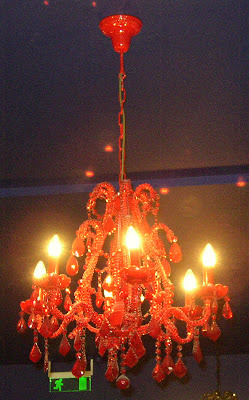 Last week was quite a busy one, so I am relishing this week, which is much more quiet, and catching up. 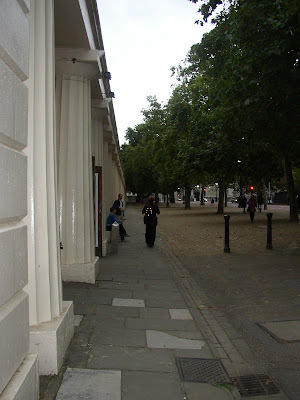 When I lived in London, I saw little of it. Studying for a PhD in chemistry is an intense business. 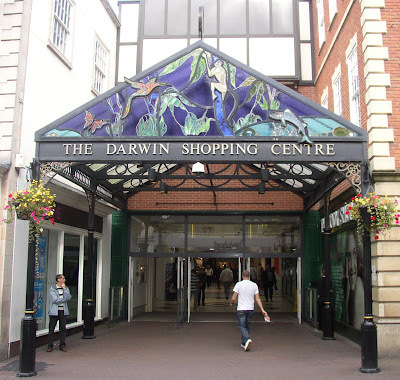 I used to scurry back and forth from my flat in Dulwich to my lab in King's College on the Strand, rarely going anywhere else, except for shopping for essentials in Covent Garden - the weekends filled with housekeeping and seeing chaps (well, mainly Hodmandod Senior). 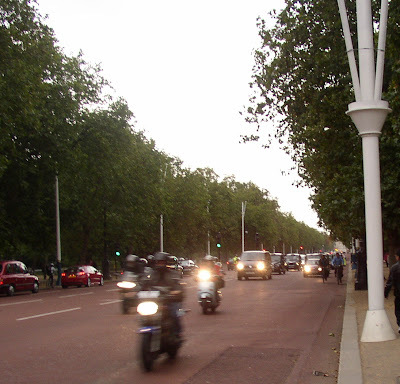 I didn't tend to go west of Charing Cross, and so was only dimly aware that Trafalgar Square was at the end of it. 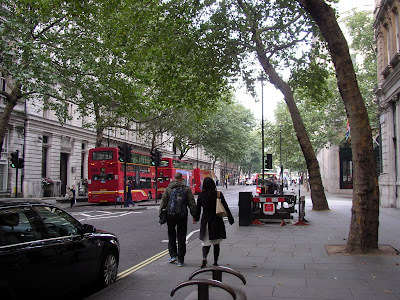 But last week this is where I stayed - just off Trafalgar Square in Northumberland House on Northumberland Avenue (the entrance marked with the subtle LSE sign above) - and if Charing Cross is the official centre of London, then this must be the most central hall of residence. I was given a room in the back, and it was quiet, clean, comfortable and, since it was university accommodation, very cheap. It even had its own tiny ensuite facilities - which were a revelation in how much plumbing can be packed into such a small space - but it worked, and I would love to stay there again. 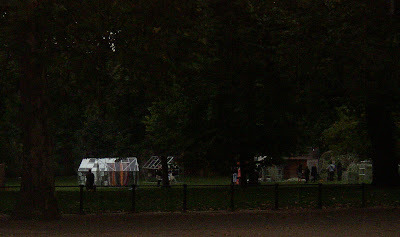 and at the end of the Mall, Buckingham Palace, and all this set in the greenery of St James's Park. 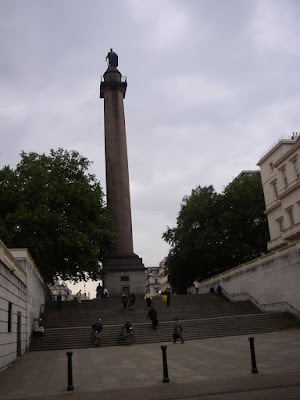 The Duke of York's column. There were some great pieces here, and the project itself I found very interesting. I shall deal with each one in turn in separate posts. 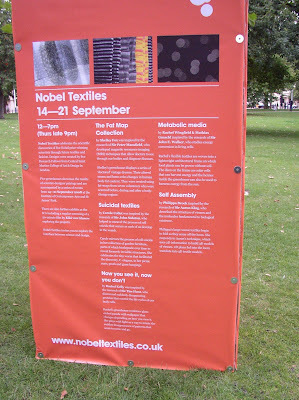 As I walked around the artists and two of the Nobel scientists were there too, which was exciting. 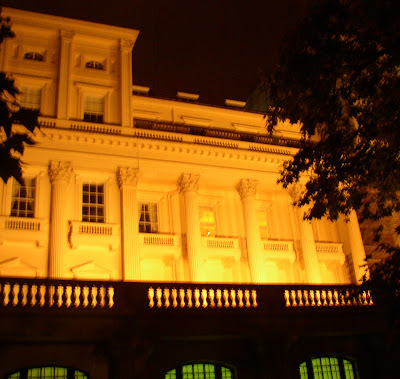 Then, as the dusk was coming, I went inside and listened to a debate. Later, came the reception, and I met Laura Nelson, a writer from the MRC, who had invited me... and also an architect and a film maker, and a couple of textile designers, so it was a good and invigorating mix. It gave me much to think about...and I am still thinking about it now. in bronze outside the most magnificent town library I have ever seen. 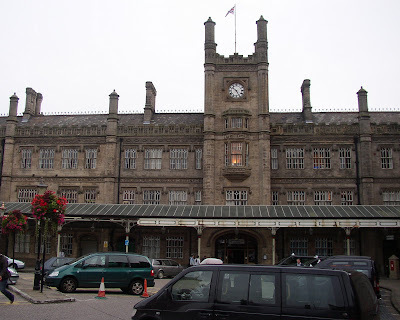 or this, the Old Market Hall where I met Penny Thomas, my new editor from Seren in the cafe on the first floor. Ah, the quiet shuffling of thoughts among the cakes and tea, it was a very pleasant way of spending a couple of hours. Now that I have been prompted gently into thinking of new ideas, I have a way of going forward, and have found that my book will be copyedited (which is becoming unusual these days). So I am very happy. 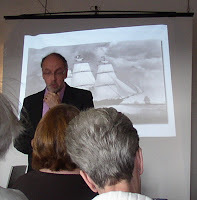 Authors North AGM - the effect of the internet on the world of publishing. 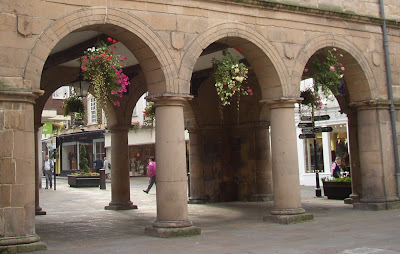 I think we're all getting used to getting a lot of free information over the web; but last Saturday, at the Authors North meeting in York, we were asked to consider if this is always right. Authors North is part of the Society of Authors, which is, in part, a trade union, and so one of its main functions is to look after the rights of authors. As more material is put on the web some aspects of publishing, like academic publishing, are faring badly. For many of its authors work is becoming scarce, and when they do find any, they are being asked to do more and more for less and less. For instance publishers are now expecting authors to do their own picture research, indexing, create and maintain their own website, and pay for any permission fees from their own pocket. I certainly had to do these last three things for my novels, and I remember it being a bit of a shock. One of the ways forward may be for these authors to publish on the net but restrict access to websites to those paying a fee. 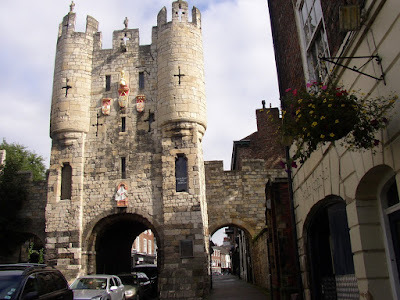 One of the gates leading into the city of York. The first guest speaker was Michael Schmidt of Carcanet Press (which produced Elaine Feinstein's book rather beautifully - reviewed here). He has been running this small independent press for over 40 years (with subsidies from the Arts Council). He is also professor of creative writing at the University of Glasgow. In his capacity as professor he said that he had observed a change in culture with many younger readers finding information from the screen, and consequently losing the habit and ability to do traditional research. However by using search tools like google it was still possible to come up with fresh angles, and he thought that another benefit of the computer-age was that through email the art of letter writing had been rediscovered, while texting required an imaginative approach to language. As for authors' websites, he recommended the use of google analytics to find out where visitors come from, and advised every author to make sure they had an entry in Wikipedia. He said that blogs helped to build up markets by allowing a dialogue with readers. There had been a 70% growth in creative writing courses in universities over the last few years (I failed to write down over how long). These are consistently oversubscribed. A lot of people seem to be desperate to become writers, and most of these want to write fiction or poetry. 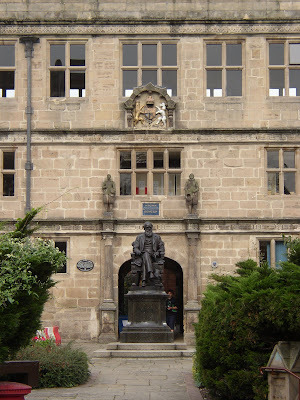 This has resulted in an enormous output of writers resulting in an overproduction - although his own university has had a high success level with a high proportion of students achieving publication. Literary agents now act as filters for publishers and some of these receive 120 manuscripts a week. 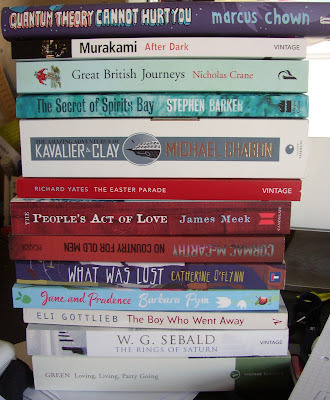 In fact the reading culture is fast turning into a writing culture in the UK, and there has been a change in how writers are emerging -- predominantly from these MA and PhD courses. 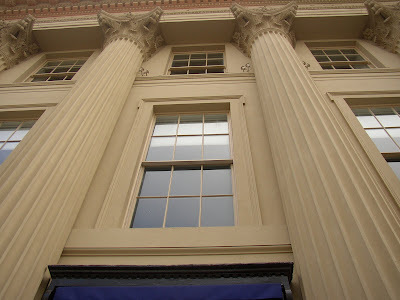 He then went on to booksellers - how the pattern was changing here too. The discounts demanded by the booksellers have increased, as has the importance of front of shop displays. The advent of Amazon has, for a small publisher at least, restored the levelness of the playing field, but has blurred the boundaries of territories, so that a book sold by a publisher in the US is available in the UK, even before the UK publisher has published it. 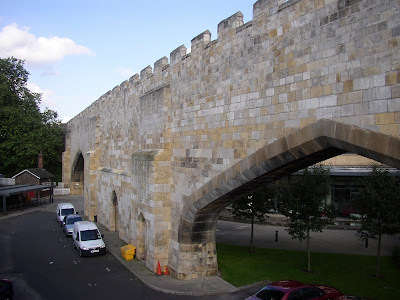 Part of York's city wall. The final speaker was Rayner Gill, a manager at Borders. He was asked to speak at fairly late notice I think, and he won us all over. Somehow he managed to be supportive - not only of his company - but of authors too, and ended his talk thanking us, and appealing to us to continue, which was extremely gratifying. Again there was discussion of discount - up to 90% on the 3 for 2s! This is all the result of the abolition of the net book agreement - and if this is not brought back (and I don't think it will) these are here to stay - and (in my opinion) the publisher, bookseller and the author will all suffer. If Tesco enter the bookselling business then things are likely to become even worse. The advent of ebooks will cause things to change again. These cost pennies to produce, and will result in all sorts of works being published that would not normally be published. I suppose the control will be gone, and, as we have seen with the advent of many more channels on the TV more choice leads to a lowering of quality. However, like me (and a lot of other people on Sunday Salon) he doubts that the ebook will ever fully replace the physical desirability of the printed book. Nothing can replace the pleasure of holding a book and reading it. The market may well be strongest for large textbooks that are cumbersome to handle. This is just a summary of the day. Of course an important part was the socialising. We said good-bye to Sheila May who has been a long-standing member of the committee and elected June Oldham in her place. We also said good-bye to Sarah Baxter, our representative from London - it has been a pleasure to work with them both. 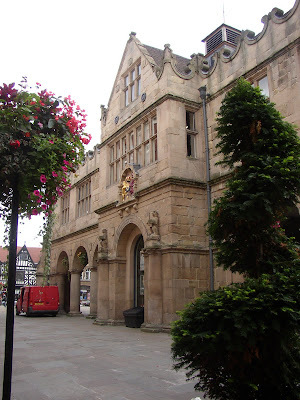 I saw little of York - just the gateway to the city and the walls. 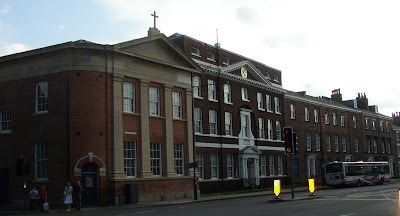 The venue was an old convent which had been converted partly into a meeting place. It was just a short walk from the station and looked like an interesting buiding in its own right. Hello, Sunday Saloners! It is the season of 'mists and mellow fruitfulness' in this part of the UK this morning. Autumn, at last! Chapter two told me how the Tardis (Dr Who's time machine/space craft) could be bigger on the inside than on the outside, examined the possibility of teleporting, and then looked at how the doctor might manage his toilet facilities by describing exactly what goes on aboard the shuttle and space stations (it involves funnels, pipes, leg rests, clamps and vacuum suction). 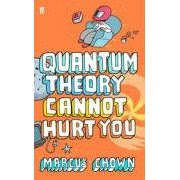 I think one of the aspects of this book that I like the best is that it not only considers the basic science, but also asks some quite philosophical questions: for instance, after considering the vast amount of information transfer required to teleport a human, it asks about the soul, and if that is transferred too. Chapter three deals with time travel, and explains how this might be possible if the time lords were able to take one of the transient microscopic worm holes (that are thought to be constantly forming and fading away around us) and threaded it with something called 'exotic matter'. This would make the worm hole swell to a usable size and so the doctor's tardis would be able to glide through to somewhere in the future. There are two caveats to this, however. One is that the location of end-point of the wormhole would be difficult to control (this fits in with what happens in the series, the doctor is always ending up in the wrong place and time), and would only allow travel forwards in time from when the technology to do all this was discovered. However this is all right too -it just means that the time lords have been able to do this from the start of the universe! Anyway, to continue... Chapter four compares regeneration with what goes on when a hydra loses one of its parts (it involves reversion of specialised cells to stem cells and is very interesting); and then describes how one man, Ray Kurzwell, plans to live forever. This involves drinking green tea and nano-robotics. Chapter five examines the technology behind the doctor's sonic screwdriver, and chapter six reveals that I am, I mean, was, not the only woman to fall in love with the doctor. According to Dr Petra Boynton this is quite normal (something I shall be telling Dr Grump next time I see her - since I confessed to this last week she had been given me the same look I have seen her give her more 'exotic' subjects in her sexual dynamics laboratory). I am now on the second section of the book which goes on to describe other worlds - what would it be like to be on a planet that orbits a binary star, for instance, with constantly changing lengths of day and night, and orbits that rotate one way and then the next. And what would it take to destroy a planet like the Time Lord's Galifrey (the answer is an extremely large bomb of antimatter). The Cybermen chapter contains some amazing facts about the clients of a beach club in Rotterdam and a man called Kevin Warwick who works at the University of Reading. I have heard about this man before - but every time I read about his experiments on himself and his wife (they had microchips implanted into their bodies that were linked to their nervous systems with startling results) I am more and more impressed. and thought about the way the steam above cooling towers billows out but never seems to move no matter how long you watch, like the hour hand of a clock or the hair on your head or the petals of a water lily when the sun comes up. and then on Wednesday go to the Frances Bacon exhibition in the Tate Britain. York, Shrewsbury and the ICA in London - should be good. I shall, of course, be taking my camera. At the Sciblog conference I presented a few slides as part of a powerpoint presentation. Corie Lok, a senior editor at Nature, has just told me of a way of uploading my presentation to the internet so that anyone can see it. It is called Slideshare and I think it is a great little site. I've just tried it out, and although there are a few technical glitches with mine at the moment, I can see its potential. I shall post up the URL of my talk once it is ready. I think it is so good of the people who developed this software to make it available to everyone - a great example of the altruistic nature of some parts of the internet. When I get a chance I shall upload my Alfred Wegener and 'Women and Madness in the 19th century' presentations too. They were quite a lot of work, and might be of interest to one or two people of the millions now on the internet - so it is great to be able to share them. Update: The glitches turned out not to be glitches after all. Once the presentation (which you can see here) is downloaded from the Slideshare Website, everything is fine. ...an excellent set of articles on lies, damn lies and statistics, written by Michael Blastland on by the BBC news website (some of whose journalists, according to Dr Grump, are as much to blame as anyone else). The winning blog will earn the chance to be included in The Open Laboratory: The Best Science Writing on Blogs 2008. The blogger and instigator will also each earn expenses-paid trips to Science Foo Camp 2009, to be held in July or August (exact date still to be confirmed) at the Googleplex in Mountain View, CA. The decision of the judges (that’s us) will be announced in January 2009, will be final, and will probably be somewhat arbitrary. 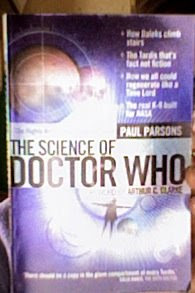 Sunday Salon on The Science of Dr Who by Paul Parsons. Yesterday, the programme of the Chester Literature Festival came through the post. Poetry features strongly this year, and there are several sessions by politicians. Although I am keeping October free this year (the German translation of my Wegener book is coming out then and there's talk about my giving a talk in Frankfurt) there are a couple of non-fiction events that appeal: Nicholas Crane's talk about Great British Journeys and Paul Parson's on The Science of Dr Who. 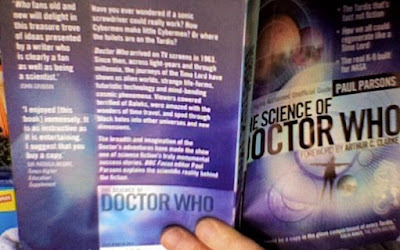 So, this Sunday, I find myself dipping into the first of these books: The Science of Dr Who. It's got a wonderfully glossy cover: highly reflective, with a slight 3D quality, seemingly close to a hologram, and when it catches the light it reflects small rainbows...but I guess that is a small point (although it did attract my eye to the book). It is also recommended by an eclectic range of people: including the astronomer and great populariser of science, Patrick Moore, and the actor who played the sixth doctor, Colin Baker. Of course the best Dr Who was Tom Baker. Even though the two most recent re-incarnations have both been impressive, Tom Baker, remains, for me, the definitive doctor. He was wild, maverick and slightly edgy - a Heathcliffe let loose in time and space. When I was at school I was in love with him for even longer than the weeks it took to knit 'his' scarf - carefully matching the colours and ensuring that it went several times around my neck and then down not just to my ankles but trailed along the floor. I was sure it would have been a mutual attraction if only he had known about me - after all, underneath that gruff unpredictable exterior there beat not just one heart, but two; and therefore could easily have had room for two women. The attractions of my rival Romana, I felt, would be short-lived. Just from looking at the way she dressed - shallowly and shamelessly provocatively - I could tell she had no inner depth. He would soon tire of her, I thought, and would become hopelessly attracted to me - once we had all spent a couple of centuries in his tardis together. The first chapter of The Science of Dr Who is about these two hearts. 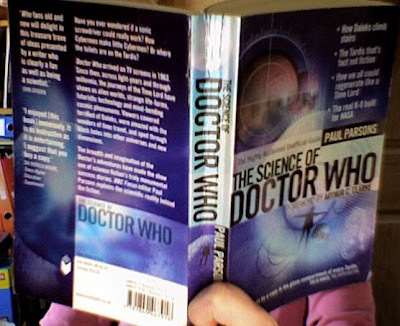 After a physiological consideration of the benefits of having two hearts (more even blood flow, and less stress on the each heart - although difficult to synchronise, perhaps); the chapter goes on to deal with the important matter of the emotional heart of Dr Who and his altruism. Where does altruism come from, it asks, since it is so obviously at odds with the concept of Darwin's survival of the fittest. The answer comes in two ways: maximising the survival of one's genes may mean that supporting close relatives is of benefit too; and the support of strangers is often of mutual benefit. The examples are interesting and the the concept itself is fun - especially, if like me, your interest is long-term and has sometimes bordered on the obsessive. Meet Tiana, aged 8. 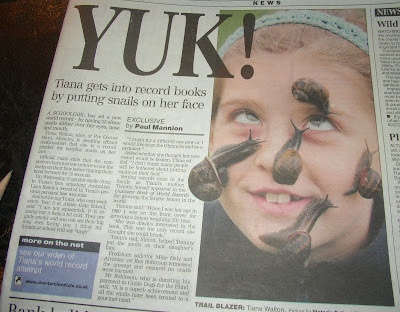 She has now set a world record by having 25 snails on her face. There is a video, here. And an article is here. I particularly like the last line: "It is a superb achievement and all the snails have been treated to a gourmet meal." It is so easy to misread this. which is about to be published in paperback. I've read and met both these writers and it is my considered opinion they are brilliant (and I don't say such a thing flippantly). If I possibly can, I shall be there. I am sure I would learn a lot. 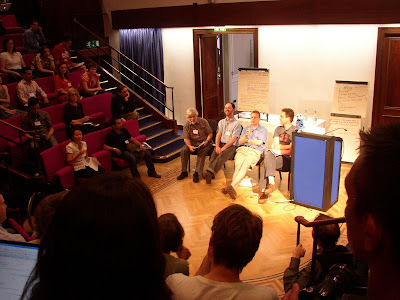 This the fourth installment of my review of the Nature Sciblog Conference. The first one is here. She took one last long drag and looked at me. 'You look dreadful.' she said. For a few moments we stood together in silence before going back inside to the library. It was hot and I couldn't concentrate, and soon all the words were jumbling around like Poincaré's atoms. 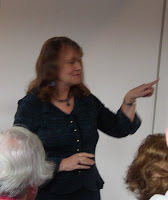 However I managed to note that Maxine skilfully handled the discussion on linking, and several people made valuable and interesting contributions, then there was a summing up session with Peter Murray-Rust, Cameron Neylon. 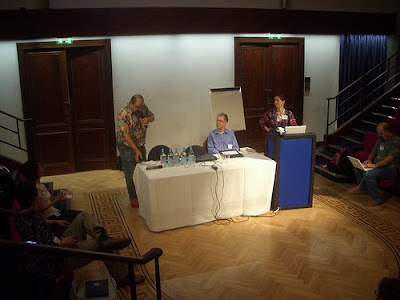 Richard Grant (who was rather impressively sponsored to come to this and another conference in the UK from Australia by his department), and Timo Hannay - during which they challenged everyone in the room to get a senior member of science academia blogging - which must be more of a challenge for some people than others. Then, in the bar afterwards, I talked to Jon Turney and Brian Clegg and a couple of other people I knew, and then, when we eventually retired to a nearby pub, was delighted to meet a Danish Trekkie, Bertil Dorch. Then, after talking to several other very interesting people - someone over from the US, then another from Switzerland, yet another from Germany - I departed. Though Dr Grump was, I expect, still in full flow, and good for another couple of hours yet. It was warm. The air felt soupy and thick as if I were swimming through it. 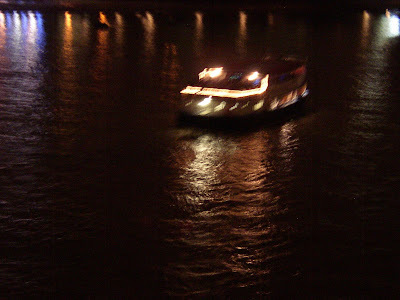 Then, as I crossed the reverberating Millennium bridge, for a few magical seconds a brightly lit boat full of dancing people passed underneath. The sound of the music and the laughing swelled and then fell away, and for a few moments I stood still and watched them drift slowly down the river. So many people I'll never know. For an instant they were quite close to me and yet completely unaware of my existence. I looked around me. Does anyone else have this - a moment of intense realisation of exactly where you are? It is as if something falls away from my eyes. I want to imprint it on my mind. 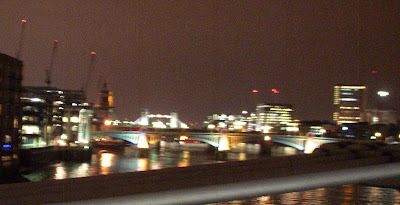 Behind me the dome of St Paul's glowed with a soft white light and to either side harsher lights marked out the banks and bridges. The music faded away altogether and I could hear the lapping of the water and a gentle murmur of voices. The great unlit towers of the Tate Modern loomed large and black, and beside it people spun around the Globe Theatre like small wasps escaping from a nest. I was invisible and deliciously alone. I could do exactly as I liked. I turned a corner where the street was dark and empty. Another city. At this point Dr Grump left the room to smoke a Gitane and I carried on with the rest of the conference alone. The panel discussion with Jenny Rohn, Grrl Scientist and Anna Kushnir, and introduced by the great Mo Costandi, was wide-ranging and thought-provoking. Bloggers are perceived as odd, Grrl Scientist said, but blogging gives everyone an opportunity to glimpse a life and communicate. Jenny said that she sees it as an opportunity to give a realisitic view of what happens when living the scientific life. While Anna valued it as a support group which she found particularly helpful when going through grad school. They also considered the question of anonymity - the pros (more freedom to express how you really feel, and what a life in science is really like) and the cons (the danger of being 'outed' and the possible detrimental effect on career). There was also an interesting discussion on how they handled negative comments. After consideration of the various options (ignore and delete, just ignore and leave, answer) it was generally decided (I think) that the best approach is to answer politely and then ignore and delete if things become offensive. After a short break in which everyone voted for the 'unconferenced' session in the afternoon it was time for the morning break out sessions. The choice was 'How to make Friend Feeds and Influence People' by Matt Wood, 'How to Enhance your Blog' by Maxine Clarke and Euan Adie and Can Blogging Unlock Your Creativity by Henry Gee, Brian Clegg and me. We were all brilliant, obviously. Especially Brian and Henry. After lunch there was a difficult choice: 'Science in Second Life' by Jo Scott, or 'Science Blogs and On-line forums as Teaching Tools' by Martin Fenner, Oliver Obst and Jeff Marlow or 'Communicating Primary Research Publicly' by Heather Etchevers, Bob O'Hara, and Jean-Claude Bradley - which was the one I decided to attend. Jean-Claude requires all his team to blog and there was much discussion of the benefits. It enables people to tell the world about their results even if they can't get a paper out of it; it can be for general public information and as a general useful laboratory notebook for your own and the rest of the team's reference. I must admit I very much like the democratic and altruistic philosphy behind this, and must be much the same as the one that drives Wikipedia. However there were objections from members of the audience and I can see their point of view too. These days, scientific life, like all life, is a struggle. There is competition for work and some scientists argued that if they were to publish their work in this way they might lose ground. As one of the speakers said - 'It depends'...on the sort of work you do, stage of your career and who you work for. I thought back. Virtually all the post-doctoral work I did was unpublishable due to who employed me: the American army and then industry. Ha, military secrets and then industrial ones! I'm beginning to be quite glad blogging wasn't around then because I doubt very much I could have withstood the temptation. It would have started anonymously, and then I would have got carried away and accidentally posted something that identified me, then deleted it and spent the next ten years worrying about it. Yes, a very good thing this Hodmandod missed this particular technological revolution in her youth. The Sciblog report concludes here. Saturday had a hazy brightness, and was warm and humid. 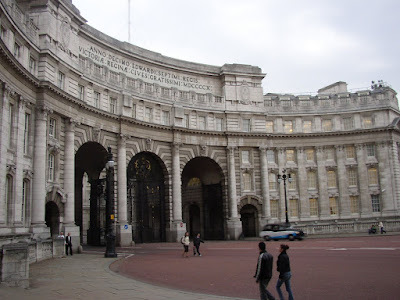 It was just three stops along the Jubilee line from Bankside to Green Park and the west end of Piccadilly. 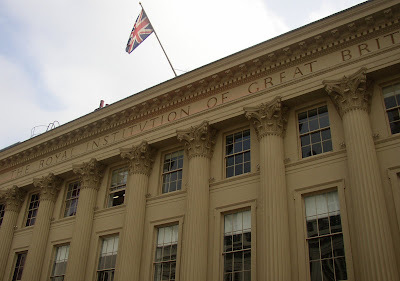 The Royal Institution is in Albemarle Street, in a series of grand-looking houses designed by northerner John Carr some time in the last half of the eighteenth century. 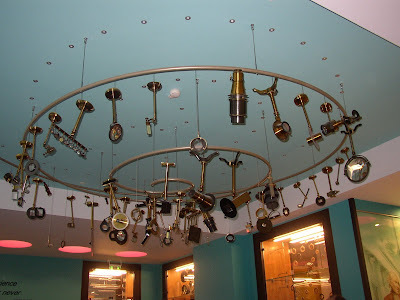 So, by London standards is not that old, and the Institution itself was only established in 1799 - a mere youngster, then compared to some of the other august establishments in the capital - and moved to Albemarle Street soon afterwards. However, during its relatively brief existence it has been responsible for much. including the discovery of ten chemical elements and the home of fourteen Nobel Prize winners. It has just undergone 'the most complete reimagining of the space in our history' and its interior is certainly now impressive - a good blend of old and new. and, of course, the Faraday lecture theatre (which is a lot smaller than I remember from watching numerous Christmas lectures when a child). 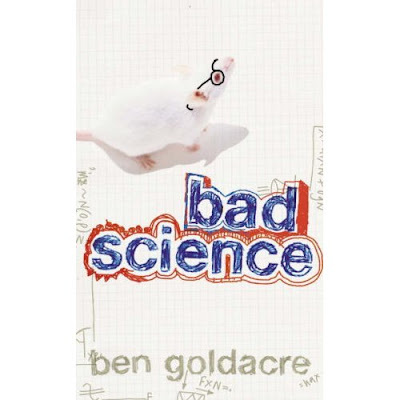 The keynote lecture was by Ben Goldacre who writes Badscience - a column in the Guardian as well as a blog...and now a book too. Dr Goldacre, it turns out, crusades against the rubbish spouted in the media about science. His first point was that the nerd has been neglected. Science, he said, is being wilfully dumbed down, and this is suiting no one. At this point I noticed that Dr Grump, who had come with me, had become oddly slumped in her chair and was lolling backwards with a sickening sycophantic smile on her face. 'What's up?' I asked her. Obviously I am used to this sort of nonsense from the woman by now, so after muttering that he was easily fifteen years too young for her (despite the application of Boot No 7 Revive and Rejuvenate every morning and evening), decided to ignore her. Young Goldacre turned out to be an inspiring speaker, describing how blogs were the new weapon in the hands of the people. Together we can stamp out the effects of persons in the media perpetuating bogus associations between things like vaccinations and autism (something which my mother still believes caused her grandson's autism no matter how many times I try to convince her otherwise) just because they happen to make good news stories. 'Yes, yes!' La Grump who by this time had stirred herself. Part 3 of the Sciblog report is here.